Art-making is all about starts, stops, and unanticipated turns. When a work goes unfinished, it may be to make room for another project… or it may just be time to move on. We asked artists: If you’ve ever had to set aside a work of art that still had potential, why did you do so? And will you ever return to it? Part one of a two-part discussion. When Mass Cultural Council asked me to answer this question my first reaction was: when have I ever NOT had to set aside a creative project? As a working parent who didn’t start writing “seriously” until my 30’s, I feel as if my creative life is constantly fragmented. I’m engaged in an ongoing struggle not just to make art but to cultivate an audience: it all takes time, and inevitably, some projects get shelved. One thing I’ve learned over the years, however, is how to quickly pick up on a project where I left off. I’ve made myself adapt, finding ways to enter a deep creative process somewhat on the fly, using the materials at hand for inspiration. It helps me to have faith that those shelved projects will someday be dusted off and revived. A great example is this blog post. I carried the question around in my head, mulling over what I might say as I drove around, delivered kids to school, went to my (paying) job. I was feeling frustrated, because I’d had no time to write – anything – for weeks. Then, when I finally squeezed in a little time to write, I found myself using the question as a prompt for my writing, and I ended up with the question as a poem! I like to think that when people say artists are ruthless, this is what they mean. We do what we need to do to keep the ball rolling. For me, it is less about setting work aside and more about having the time to explore unresolved ideas in the first place. My time for a week (168 hours): work related – 40 hours; sleep – 56 hours; cooking + eating – 18 hours; errands – 6 hours; shower – 3 hours; commute – 5 hours; morning coffee routine – 7 hours; family time – 5 hours; friends + beer time – 5 hours; housekeeping – 3 hours; physical therapy – 3 hours; meditation – 2 hour; dithering – 7; studio hours – 8. Time is my worst enemy. When I have limited time in the studio, I only do what I need to do rather than what I’d like to do. Unfortunately, unresolved ideas end up on the back burner. As I write this, I am making myself aware how important it is to plan my time and not pressure myself to produce work if I want enough time to explore. Five years ago, I had my first sabbatical. I did go back to a few unresolved ideas then. It helped me develop my work and changed my work result of it. It would be nice to have sabbatical every other year… but till then, I need to pay more attention to how I strategize my time for studio. Actually, I do this all the time. As a video and video installation artist, there are many stages to my projects so I often have pieces that haven’t been fully realized. I call them “ideas on the shelf.” I see them as ideas that are in progress, but perhaps resting, that could be picked up and modified at any moment. Though these works-in-progress will have some set properties, I’ll adapt video attributes, installation aspects, or the scale of the pieces to best inhabit the space in which they will be shown. Many pieces are just waiting for the right combination of factors, or a large exhibition space, to emerge as finalized pieces. If I’m doing a site-specific projection for example, I’ll test various pieces of footage from my archives to see what makes the most visual and conceptual sense for the site. Once it is clear what will be best, I’ll either make a selection from my unused footage and/or film new material. I’ve had footage that has sat anywhere from six months to five years waiting for it’s right “home.” Only time will tell what will become a piece and what won’t. Read Part Two of Work You’ve Set Aside, featuring the perspectives of a novelist, a composer, and a furniture maker. Amy Dryansky is a poet and author of Grass Whistle (Salmon Poetry, 2013) and How I Got Lost So Close to Home (Alice James Books, 1999). Read her poem “No Animals Were Harmed in the Making of This Poem,” written in response to this post. Georgie Friedman is a video and installation artist. Waves and Currents, a dual show with Canadian artist Lenka Novakova, is at Morlan Gallery at Transylvania University in KY through Oct. 11, 2013. Megumi Naitoh is a ceramic artist who recently won a 2013 Brother Thomas Fellowship. 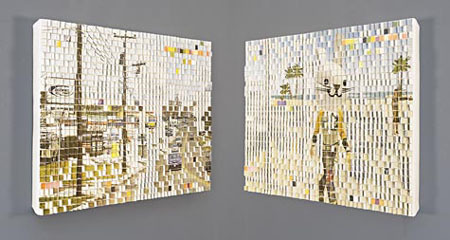 Image and media: Megumi Naitoh, view of two sides of DECEMBER 28, 2009 (2010), screen printed ceramic earthenware, 30.75x20x2 in; excerpt from SPIRALING WATER by Georgie Friedman.